Life has a way of answering questions in ways that are completely surprising. I’ve been trying to write my thoughts down about resistance and horses for months. Never really liked any of it, couldn’t find a flow, a theme, a clear way to put into words what I was feeling. Then earlier this month, something happened that unleashed the words, though I wouldn’t want to go through it again nor would I wish it on anyone else, horse or human. It only took my horse falling on me to now understand that “resistance” is a completely human concept. I’ll return to that story in a moment. What is clear to me now (post accident) is that horses will do things because they don’t understand, because they are avoiding pain (or experiencing pain), because they are afraid or worried or tired. If we feel what we know as resistance, it is because we are bringing it to the horse, and re-interpreting it in the only way we, as humans, can understand. For horses, there is no such thing as what we would call “resistance.” None. The delicious thing about this horsemanship journey we choose is the chance to move beyond human perceptions, human imaginings and human ways of doing things into a completely different world. The horse, a creature whose nature is water embodied, will almost always flow in the path of least resistance. They are the stream, and (without meaning to) we are the rocks around which they flow. I believe, have felt and seen and witnessed so many beautiful moments when horse and human are both rivers, blending their movements together to create a living picture of harmony. And isn’t that one of the many reasons we love horses: to experience moments that allow us to get out of ourselves, and see the world from their perspective? So if horses choose the path of least resistance, and yet they do things that (to us) are unexpected or contrary to our own wishes, what is going on? 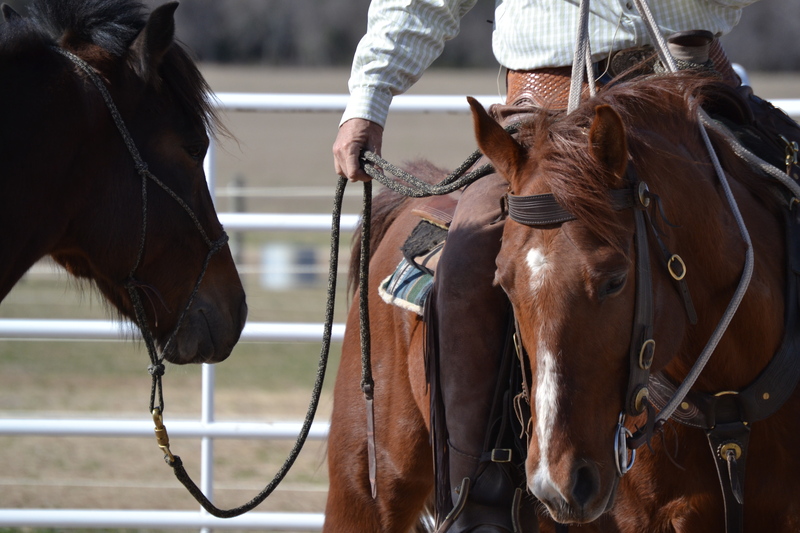 Here’s an example (saying that the horse, to our knowledge, is not having any physical issues, the saddle and tack fits, teeth are balanced and his feet are taken care of appropriately): a rider asks his/her horse to go from walk to trot. There’s a tail swish, a pin of the ears, and an abrupt transition after the rider has to apply a lot of force with their legs. Once in the trot, it is rough, without rhythm, and the horse keeps trying to get back to the walk, while the rider uses their legs to keep him trotting. Again, if we feel what we would call “resistance,” it is because we are bringing it to the horse. What is meant by that statement is this: either our bodies (the outside of us) or our emotions/thoughts/intent (the inside of us) close and create a sort of roadblock the horse now has to get around. This would be a case of being the rock in the stream. Usually the rider, either through learned habit or unintentionally, will tighten the outside of the body in preparation for the transition. The usual spots we go to are the lower back and shoulders. The extremities can join the party too, until our whole body is locked, and we are saying “go faster!” to our horse. These are two separate and distinct messages to our horse, who now has to stiffen his body (in response to our stiffness) but move freely at the same time. The part of us that wants to go from walk to trot (the inside of us) will sometimes follow our body. In other words, our focus goes from “my horse is walking,” to “I want my horse to trot.” I’ve seen, probably thousands of times, riders freeze on the inside. This is most apparent because the rider momentarily stops breathing. I often joke that somewhere buried in the dark little ancient part of our brain, is a voice that is saying “riding something this big and this fast is reeeeaally risky!” It’s only kind of a joke though. After talking to many riders, and witnessing the many ways they use their bodies in a transition, it occurs to me that somewhere in us we go from “Let’s trot,” to “uh-oh!” to “Whew! That went well.” to “Why isn’t my horse trotting more smoothly?” etc. This happens, of course, without our being aware of it. And, we can also see the disconnect in the languaging. It is all about what the rider wants the horse to do. There’s nothing wrong with this, and we aren’t bad people if we fall into this habit. But one of the things we are looking to do is take away the rocks in the stream, to open things up a little. 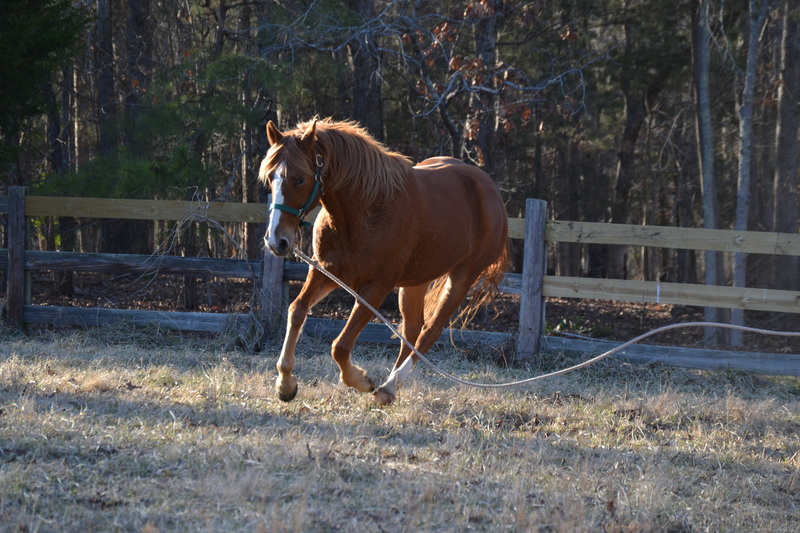 One of the ways to do this is to think about how “we” (my horse and I) can move into a different rhythm, the trot. So here’s a different scenario: the rider takes a deep breath in, and exhales while thinking, “WE are trotting now,” then applies a cue with their relaxed legs, if needed. The rider will keep this pattern going until he/she and the horse are doing the same thing (trotting – for the rider this will be focusing on trotting with their intent, for the horse this will be the inside and outside of them trotting), at the same time, with a sense of relaxation and openness. For that is the opposite of resistance (in our world). Openness. 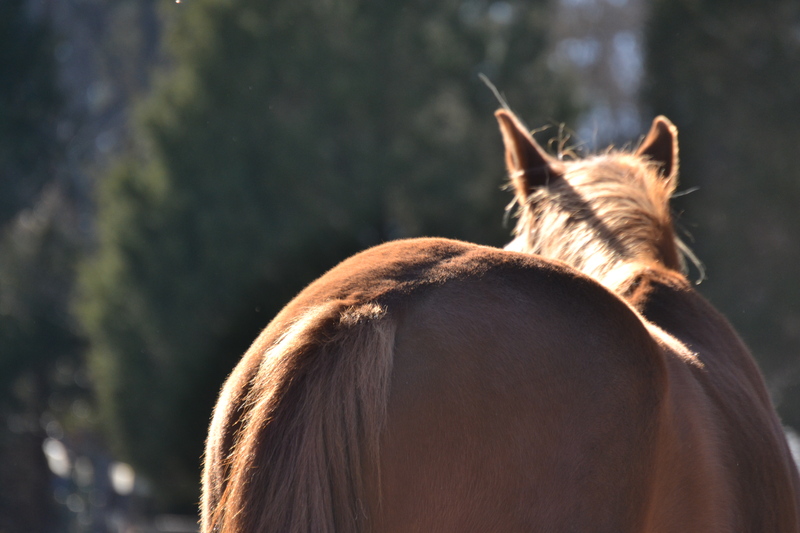 If we can’tpresent openness to our horse, it’s going to make it very difficult for our horse to find it (not that they can’t, it just complicates things). It becomes about how do we open into each request, from the outside and the inside of us. If there isn’t any resistance in the human, it is much easier for the horse to relax into what ever request the rider makes. This is the good news/bad news part – presenting tension equals tension from the horse. Presenting relaxation equals the horse relaxing. Keep in mind, please, that if you and your horse have a long-standing history of doing things a certain way, changing it will take a bit of time, a bit of patience, and a bit of a spirit of exploration and discovery. Back to the accident, if you want to call it that. Personally, it feels to me more like an awakening. My mare Bree and I were getting ready for a trail ride with Mark and some friends of ours. Over the past three years, I had been rehabilitating Bree and taking it even more slowly than I normally do. Occasionally after being girthed (always slowly), her hind end would collapse, she would flip over backwards, and then scramble to get up. I wasn’t ever on her when this happened, and it hadn’t happened in over a year. I thought we had found a way to eliminate the issue through a combination of treating her for some physical issues with both veterinarians and different bodywork modalities, diet, lifestyle management, and my own focus on keeping the saddling process low stress and let her move-literally-through it. Once I was on her back and we were moving, she was fantastic; agreeable, soft, willing. On this warm day, she fell again, but this time I was on her. And we were standing still. I was instantly knocked unconscious, and landed to the left of my horse as she fell to the right. My right thigh was hit first by the cantle of the saddle, and then her hoof as she scrambled to get up. The details of that day, and my recovery and healing since, don’t need to be addressed here, except to say that I know how fortunate I am, and I am still experiencing a vast sense of gratitude and joy at being alive. So what does this all have to do with resistance? This is what I’ve understood since my return from the hospital (with thankfully nothing more than a concussion and soft tissue damage to my right thigh). We spend a lot of our lives saying “No.” Now, saying “No,” is also completely ok – in fact healthy. Resistance is also healthy – think Martin Luther King, Jr., Mahatma Gandhi, or the women’s Suffrage movement. What I am speaking of here is our habit of giving a negative answer, or a negative outlook, or a negative thought without examination – almost as a way of life. If we’re not careful our horsemanship (and our life) can become a litany of No’s and Don’t Do That’s. “Don’t pull on the bit, don’t fall in on the circle, don’t anticipate me, don’t canter when I want a walk, don’t pin your ears, don’t don’t don’t.” This isn’t necessarily bad or good…but what it can do is add another rock to that stream. Add enough rocks, and the stream gets diverted. It goes somewhere else. What if we were, instead, to focus on being more open ourselves, and helping our horse through troublesome spots? What if we could lay to rest this notion that it is us against them (whether horse, spouse, friend, dog, neighbor, etc)? Our horses may be giving us the perfect opportunity to examine such things, while at the same time helping them (and us!) to feel better about what ever it is we are doing. I’ll give an example. When I was in the hospital, a lot of tests were run. Everyone was very kind, and caring. But I was scared, and in pain, and drug hazy. Vulnerable. An uncomfortable feeling for most of us, I think. For what ever reason – probably all listed above – I accepted what the doctors and Mark were telling me, and thanked everyone for their care. I couldn’t stop voicing my gratitude, even when crying with pain and fear. I couldn’t resist – simply because my body and mind could not. I’ve discovered that my tenacious grip on my own independence was the first thing to go. I couldn’t resist help, because I wasn’t in a position to do so. As I got better at resisting help less, I noticed a funny thing. Peace of mind. People (especially Mark, who has been with me from the beginning of this adventure) are generous, and genuinely desire to help others feel better. As I was helped with such generosity, my grip on my belief of “I can do it myself!” loosened. As this part of me loosened, I began to relax. My pain was manageable. I felt happier, at ease and grateful for all the support reaching out to me. That sense of less resistance has continued. Less busy mind, less judgement, less tendency to jump into my comfort zone and defend it. It’s not gone, but it’s less. And I have to say, living with less resistance inside of myself is a pretty ok thing. Our pliability, our commitment to relaxing inside and out, in tandem with helping our horse to feel better, will equal a river that flows easily around what ever obstacles are in it’s path. This is harmony. This is flow. This, in my opinion, is the world of the horse. I’ve come to the same conclusions in the last year – I just wasn’t feeling good about the idea that I needed to escalate pressure or push the horse – I suppose it comes from my days of doing nothing but body work and knowing how often we inadvertently end up pushing horses through pain…. I had been seriously considering quitting riding because it didn’t feel safe to ride and it didn’t feel fair to the horses. Your e-mail about your accident came at a time when I was in the midst of doing some serious examination of whether or not I wanted to keep riding. I feel fortunate in finding someone to work with who could show me a way to ride that supports rehabilitation and soundness but also flows with that river you’re talking about instead of creating resistance. I’m so glad to hear you writing about this topic!!! And I’m SOOOO glad you’re safe and healing. Thank you Andrea – it seems we often reach places that cause us to re-evaluate what we’re doing and how we’re doing it. I’m glad to hear you are journeying with horses still – you have so much to offer and give, however that looks. Timely. Very timely post. Thank you for your vulnerability and openness. Your paragraph where you write “The horse, a creature whose nature is water embodied, will almost always flow in the path of least resistance. They are the stream, and (without meaning to) we are the rocks around which they flow.” Gave me the shivers, a truth that was crystal clear and went straight to my heart. I will carry this every time I ride. I am glad to hear you are healing well and thank you for your words. Thank you very much for your honesty and thoughtfulness – very helpful to me and my horses on our journey together. Glad you and the mare are OK and that you’re healing. As you point out, those moments can really cause a reexamination of how we’re thinking about and approaching things – I had a moment like that with a bad fall/concussion/broken bones back in the summer of 2011. Well said, Crissi! I have often thought the whole idea of “resistance” on the part of the horse was wrongheaded. Of course, trying to accomplish some goal with a horse without forcing anything is like practicing Tai Chi Push Hands: you keep the conversation going and all of a sudden, things shift for a moment, only to shift back. Practice helps the shift to stay longer. May you continue to heal well. Beautifully said, and the image of a river flowing around rocks is such a good one to replace the brick wall that I seem often to run into! It’s surprising how much a word or mental image can affect our emotional responses. Thanks for all you do! I am sorry that it took a frightening and painful experience to help you find a way to put into words what you have been feeling. But I am truly grateful that you shared this. So much of what you have said to me, or written, resonates deeply in my mind. My horse and I are developing a deeper understanding of each other with every passing day. Thank you. Learning to release resistance as best I can has been powerful for me and it took me till age 66 to start learning this! You are so fortunate to be learning it so young. Pain has been my teacher which was very great both before and after a back surgery. But I would notice at first, that just simply time spent around the horses would take the pain away temporarily. In time it occurred to me that if I could just accept whatever came in the name of pain, not resist or fight it, just let it be what it needed to be, that I felt so much better inside and ultimately outside. So I am amazed at your young wisdom which took me so much more of life to understand. Sharing this intimate piece inside of you with us is such a gift. Thank you. Such a thoughtful post. I too, really love the idea of horses being like a flowing river…such truth and a bit of beautiful imagery that I will keep in mind when riding my horse. Going with the flow in complete openness and relaxation. Beautiful. Thank you. Thank you, Lorie, and thank you for taking the time to let me know how this landed with you. Thank you so much for sharing your journey. Thank you Nancy for taking the time to share in it!